MODEL NCH26 - MOST POPULAR! You want BOLD? Try this one on for size! Absolutely stunning Victorian. 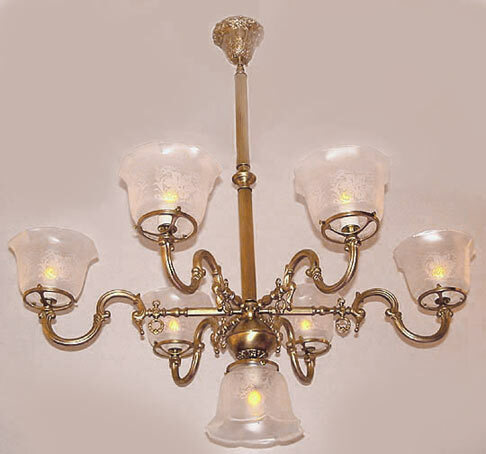 Heavy cast brass arms and reeded center tubing and arm extensions (smooth tubing also available). Note the East and West arms are extended to created an Oval configuration. The tubing which pushes the arms outward can be longer or short, or removed completely to make this one "round". Perfect for a rectangular or oval table with the longer arms pointed to the head and foot of the table. Don't need the downlght? Replace it with a lovely 4" ball or finial if you prefer! Can also be made in round configuration.